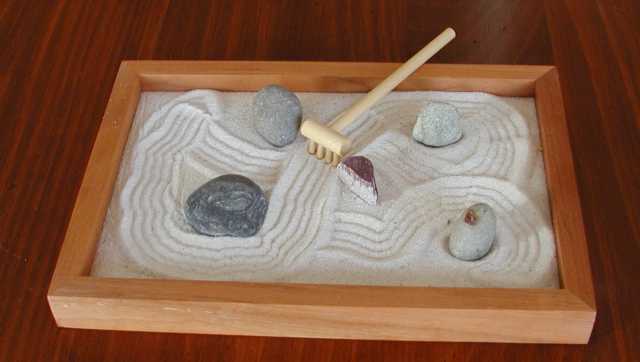 I don’t understand Zen gardens. I especially don’t understand those miniature ones people buy and put on their desks or coffee tables. I am not saying it is a bad thing. If it makes you feel calm and relaxed, by all means, rake away. In fact, being the nice person that I am, I will totally let you come to my house and rake the back yard. Hubby hasn’t done it in a few months, so if you like raking, you will leave so relaxed you can cancel your next five therapy appointments. By which point I will probably have more for you to rake. So basically I am saving you a ton of money. Technically, hubby is saving you a lot of money, so you may direct your thank you notes to him. But seriously, will someone please enlighten me on this? How does a little rake that probably belongs to Zen Barbie, and a small box of sand equal calm? I personally would be terribly frustrated with the whole business. Not to mention my complete lack of coordination would ensure a giant sandy mess everywhere. Leading to more frustration. Would I then have to clean up all the sand with the little rake? Or is there also a little broom that comes with the kit? Maybe instead of a Zen garden it would make more sense to have a little box built like a kitchen. Then you can use a mini broom and dust pan to get under the itsy bitsy stove. I can get behind that concept.